I began my service with the Mail Order Department in September of 1969 and although two and a half years had gone by since that ad not much had changed nor was there much growth. The address had changed from 26 Second Avenue to 61 Second Avenue and two more books, Teachings of Lord Chaitanya and the abridged edition of Bhagavad-gita had become available. The fledgling order dept. operated out of the “office” on East 10th Street where Brahmananda and previously Rayarama had worked. The very first morning I went there Gadadhara Das (Joel Chalson) was opening the few pieces of mail that had arrived with orders as well as requests for information. I was there to type Brahmananda’s letters but it was quickly decided that I would be taking over Gadadhara’s responsibilities which was fine with him since he didn’t like office work one bit. A few months later, when Brahmananda and I relocated to the Boston center, the Mail Order Department came with us and became linked with ISKCON Press. By the end of 1970 the Movement had grown significantly. Part of the reason was what I call the “Trifecta of 1970.” Three major events took place toward the end of that year. The first is that the KRSNA Book was printed and began being distributed to the public. The second is that the London Radha Krishna Album was produced by George Harrison on Apple Label with some of the cuts making the pop charts in England and around Europe and the third was George Harrison’s song “My Sweet Lord” being played constantly on the radio in the U.S. To his credit George played a major part in not only the album and of course his “My Sweet Lord” but he also donated $19,000 to Srila Prabhupada for the first printing of the KRSNA Book. As a result of the “Trifecta” the mail started pouring in like crazy. Given the hours I was spending on the composing machine in Boston in 1970 I could hardly keep up with the mail arriving daily. I put together an efficient system for handling the BTG subscriptions and orders for books and I found myself answering a lot of letters from people who just wanted “more information” or had specific questions about Krishna consciousness. Whenever I answered a personal letter I used carbon paper and then stapled their letter to the copy of my response and filed it away alphabetically. I began to establish ongoing correspondences with many people throughout the world. In each and every book and magazine an invitation was given to write to the secretary of ISKCON for more information and I was that secretary. The more books and magazines in circulation, the more letters were coming. Writing to people was the perfect engagement for me. When I was a kid I had a fascination with the whole idea of having pen pals around the world and I joined some clubs that hooked people up for that reason. Growing up without a father (he died when I was 10) I suppose I looked to my mother as a role model. I was very impressed watching her type on an old Royal typewriter, her fingers flying up and down the keyboard with her cigarette dangling out of her mouth. She sometimes did volunteer work for the Zionist Organization of New York. At the age of 12 I asked my mother to buy me a typewriter for my birthday and that portable Smith Corona became my favorite possession. I taught myself how to type and would often write satirical poems and articles in the style of MAD Magazine. My friend David would do the same and we’d compare our writings to see whose stuff was funnier. Just before dropping out of High School to join the temple I had taken a typing class. I figured since just like already knowing how to drive when I took Drivers Education it would be the same walk down easy street taking a typing course when I already knew how to type. My typing teacher, Mrs. Fischer had the longest fingernails I had ever seen and I wondered how it was even possible for her to type but type she did at well over 100 wpm. She was impressed with my skills and got me typing faster than ever — getting me up to 112 words per minute which was even faster than her. I had no idea at the time that I’d eventually be using my typing skill to help put Srila Prabhupada’s books into print and write to people about Krishna consciousness. By the time ISKCON Press moved to Brooklyn I was no longer engaged in typesetting. Many devotees were joining and arriving from other centers to serve with the Press and some were being trained to typeset so I was free to focus fully on developing the Mail Order Department. I had already established ongoing correspondences with many people and orders for books, records and BTG subscriptions continued to increase daily. For typing letters I was using an IBM Selectric typewriter at the time. IBM had introduced the Selectric in 1961 and by ’71 the Selectric II came on the market. It used typing fonts just like our composing machine but I still had to make corrections using white out. The self-correcting Selectric didn’t hit the marketplace until ’73 when Mail Order was in Los Angeles and boy oh boy did I love that self correcting feature. In fact, the whole concept of “self correction” appealed to me. When mailing out BTG subscriptions we used a religious non profit bulk rate system which came with very specific rules for mailing according to the U.S. Post Office. I had to sort out the bundles by zip code and tie each one up with string and label the top envelope with its destination. When all the envelopes were stuffed with BTGs, all the labels affixed and everything bundled and tied I took them to our home Post Office which, during the time we were working out of Tiffany Place in Brooklyn, was the same post office used by Jehovah Witnesses for mailing out their two publications: Awake and Watchtower. When I would see the tens of thousands of parcels they brought in by the truckloads I would become very envious and hoped that someday our BTG subscriptions would match or even exceed their volume. By ’73 ISKCON Press had been reborn as The Bhaktivedanta Book Trust and moved to Los Angeles which by then had become the world headquarters of ISKCON and where Srila Prabhupada was spending much of his time. When we first got to Los Angeles we shared office and warehouse space with Spiritual Sky Incense on Landmark Street in Culver City. After that we leased a building on Washington Blvd. and finally the BBT along with our order department moved into a brand new built-to-spec facility on Higuera Street in Culver City. By that time the BBT Order Dept. really began to rock n’ roll. It was only natural that the more the Movement expanded and the more books and magazines were put into circulation, the more mail we received. Book distribution had become the main focus of ISKCON and there were plenty of books to distribute. New volumes of Srimad-Bhagavatam continued to appear and the seventeen volumes of Sri Caitanya-caritamrta had become available. We set up the storage and shipping facility for the BBT Order Dept. in a corner of the Higuera Street warehouse. We enclosed it with fencing material and began calling it the “mailorder cage.” All the books and other paraphernalia that we sold through the mail were stocked on shelves. The orders would be processed upstairs by me and then they would go down to the cage where someone would pick each order, package and put a shipping label on it and then, using a Pitney Bowes combination scale and postage machine, calculate the amount needed to ship it out to whatever destination in the world it was going. Ranadhira and Kirtiraja had come aboard to help manage the rapidly expanding BBT Order Dept. and like myself they also had offices on the upper second floor of the BBT warehouse. Ranadhira became our business manager in charge of marketing while I concentrated on processing the daily stacks of mail that arrived. Every morning I went to the post office on Motor Avenue to pick up the canvas bag containing all the mail addressed to 3764 Watseka Avenue, Los Angeles, California 90034. Some of the mail was meant for the temple and most of it was for the Order Dept. I sorted it out and then came to the office to open all the envelopes. Ranadhira designed a beautiful color catalog and along with all the books, magazines and pamphlets he included in our inventory japa beads and bead bags, neck beads, mrdangas and kartals, and an assortment of artik paraphernalia as well as the beautiful Balarama Mrdanga. Thus we became a fully stocked and diverse mail order house. 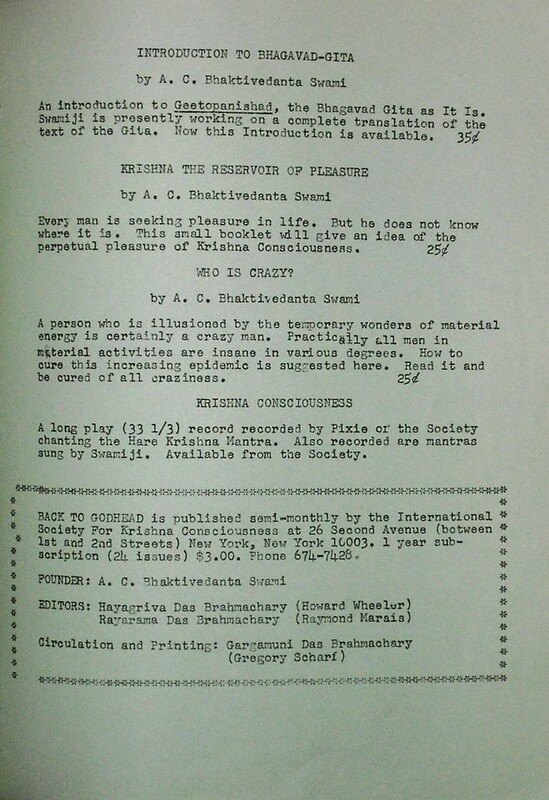 Around 1976, after looking through The National Enquirer and another smaller publication called FATE, Ranadhira decided it might be lucrative to take advantage of the “weirdo” market and aside from the possibility of making some extra money it could be a good way to bring people around to Krishna consciousness. He came up with the idea of selling a simple inexpensive amulet on a necklace. He recruited Amala Bhakta to help write copy for the ad and together they came up with “The Amulet of Tarani.” The story they conjured up was about some demigoddess type personality from somewhere in the outer universe who came to Earth to dispense blessings and good fortune. Anyone who wore the amulet would be showered with all sorts of auspiciousness including good health, sudden wealth, love, beauty and knowledge. A half page ad in the weekly Enquirer went for $5000 and sure enough … within two weeks of placing it we made back the original investment of advertising as well as the cost of the jewelry. After that it was all profit. Of course, along with the amulet the buyer also received one of our standard information packets and an invitation to write to us. Also included was an “On Chanting Hare Krsna” pamphlet and a short letter explaining that if they chanted this Hare Krishna mantra while wearing the amulet the effects would be that much greater. I got some very strange letters from some very strange people and began to feel like the Ann Landers for crazies but hey, every living being is part and parcel of Lord Sri Krishna and so where there’s life there is the possibility to preach Krishna consciousness. Srila Prabhupada taught us that by example and precept. After all, all living beings conditioned by the illusory energy are considered to be crazy — haunted by the ghost of maya. Yes, I was putting a lot of miles on my IBM Selectric typewriter and I continued the process of keeping the letters and the replies together in a growing file but no more using carbon paper since we had a nice modern photocopy machine. We had come a long way from the days of operating out of a basement apartment on East 10th Street in New York’s East Village. To name some of the devotees who joined the BBT Order Dept. either full or part time — there was Anavadyangi Devi Dasi who became a valuable and dedicated addition to our staff along with Daruka who dovetailed his bookkeeping skills for us, my sister Manmohini would come by and help out especially during a crunch such as the monthly Back to Godhead subscription mailings. My wife Chitta would sometimes help with filing and mailings and in the shipping cage we had Janananda and Chuck. Amala Bhakta’s mother Sally would show up a few days a week to help out as well. It was always a delight when she’d come into my office in the morning saying, “Okay, Swarup, I’m here … so put me to work.” She became very proficient at making buttons with the apparatus I picked up along the way. Every evening I got all the outgoing parcels and letters together and drove them to the Los Angeles airport post office. In that way they were sure to get going to their destinations quickly. It was my favorite part of the day. I would often take my firstborn son, Krishna Kumar. After getting all the packages and letters up onto the loading dock and into a gurney I’d drive over to a spot near one of the runways to watch the airplanes take off and land. Kumar loved that part of it. Before long I had established ongoing correspondences with scores of people throughout the world. Some of the “regulars” would write pages and pages telling me about their lives, their families, their schools or jobs, and some expressed a desire to eventually become full time devotees. I always encouraged them to buy japa beads and begin the practice of mantra meditation and to purchase and study Srila Prabhupada’s books. Eventually cassette tapes from Golden Avatar Productions as well as several record albums became available. As they became more and more familiar with the philosophy they began asking very relevant and intelligent questions. I liked seeing that because it was a sign that they were advancing in Krishna consciousness nicely. In order to best respond to the letters I was constantly referring to Srila Prabhupada’s books. Very often my desk would be covered completely with books open to different pages with bookmarks and notations. Srila Prabhupada was spending so much time in L.A. in those days and so I got to listen to his Srimad-Bhagavatam classes every morning and often accompany him on his morning walks. That personal association afforded me a great advantage as far as my being able to emulate his mood and preaching style. We were also getting many letters from people incarcerated in jails and prisons. I compiled a list of their names and addresses of their institutions and sent it around so that they could also contact one another. A little community of prison pen pals arose and began to rapidly grow. It wasn’t too long before so many people were writing to us each day that I had to begin recruiting some godbrothers and sisters to help me answer all the letters. That helped a lot but unless the devotee writing the reply had access to a typewriter or at least had good penmanship — and unless their spelling and grammar were okay I ended up having to retype what they wrote. Things were running smoothly but I felt something was missing. I needed to find a way to further engage these folks in Krishna consciousness. They were reading, chanting, listening to records and tapes and some were even turning fellow students or co-workers on to Krishna consciousness. I could tell, however, that many of them were hankering to engage in some kind of service. and so around 1975 it dawned on me to establish a membership program by mail. I invited people to pledge monthly donations in any amount and by doing so they would become a donor member of ISKCON. We made up official looking receipts and membership cards and according to the amount of money they sent we put together different “packages” that included BTG subscriptions, books, beads, tapes, etc. … and an invitation to stay free of charge at any of our centers. I modeled it after the life member program established by Srila Prabhupada in India but I scaled down the requirements and rather than a onetime donation for life membership I encouraged them to send monthly contributions — as much or as little as they wanted or could spare. The idea immediately took off, especially when we began including invitations to join the program along with our standard information packets. Each time a new member would come aboard I would start a file for them. The first thing I would do is send them a form to fill out giving us their names, addresses, ages, where they went to school or worked, how they came in contact with K.C., etc. and I asked that they send back a photo of themselves as well. In that way it became much more personal. I began putting together a monthly membership newsletter called “Bhakti Rasa” and we even started making sweets (laddus, burfi, lugloos, etc.) and sending them in little boxes to each member once a month. The membership program was growing bigger every day although sometimes we’d lose a monthly donor on account of them joining the Movement. Some came to join us in Los Angeles which meant that after months or even years of corresponding I got to meet them personally. Some of the people who came through the mail order and the membership program ended up becoming very dear godbrothers and sisters as well as personal friends. When I first began meeting devotees on the Internet — especially here on facebook — I’d sometimes get a message from someone telling me that I had written them some letters back in the 70’s and some even said they still had those original correspondences. Imagine how good that made me feel. The photo above is from a tour of BBT warehouse, offices and Order Dept. that we gave Srila Prabhupada when, for a short time, we were located at 8575 Washington Blvd, around a mile from the temple on Watseka Avenue. One day while looking over the growing list of members (at the end of the first year there were almost 150 people sending donations every month and many of them also corresponded regularly) I noticed that there was a large concentration of addresses in Southern California. I decided to write a letter to everyone who lived within a few hundred miles of Los Angeles and engage them in a special kind of service. At that time both myself and Ranadhira were renting spaces at local swap meets to make a little extra money on the weekends. We’d sell Spiritual Sky merchandise as well as Indian tapestries. Ranadhira would also take tapestries to a Mexican dressmaker downtown L.A. and have him cut a design for a woman’s “spaghetti dress” which simply meant an ankle length garment with thin shoulder straps. Sometimes we’d sell turquoise jewelry as well. So I asked our “local” members to clean out their garages, basements, attics, utility sheds, etc. and put aside whatever they thought could possibly fetch some money at a flea market. I requested that they write us or give us a call and we’d arrange to come and pick their stuff up. I chipped in with my friend Kadamba for a pickup truck which I used to haul all the donated items back to the BBT warehouse where we sorted out and priced everything. Sure enough … letters and calls poured in and I found myself driving all over the place — from Santa Barbara to San Diego and out to San Bernardino. It was way to make some extra money for the departmentit and a great opportunity to meet these people face to face. I ended up spending an entire day with one elderly gentleman named Alan Rahm. He was born in India of an Indian father and English mother but they relocated to the U.S. when he was still a young boy. A few weeks after spending that day talking with Alan I got a visit from a woman who looked to be in her mid 20’s. She said she was Mr. Rahm’s granddaughter. She was holding a square white box. I thought that maybe he sent her with some special item .. perhaps an heirloom or antique .. that we could add to our flea market inventory. She handed me the box and then explained that her grandfather died a few days ago. His last request was that he be cremated and his ashes be delivered to me so that I could arrange to have them sent to India and sprinkled in the Yamuna or Ganges River. In our talks I told Alan that devotees would often go to India for pilgrimage especially during Gaur Purnima when we’d have a big festival in Mayapur. I assured the young lady that I would see to it that his request was fulfilled and after a few weeks after asking around I found somebody who was on their way to India and willing to take Alan’s remains. Until that time the box remained on a shelf in my office. It became customary that whoever came into my office for whatever reason would first go over to the box and say “Hare Krishna” to Mr. Rahm’s remains. In 1976 I decided to attend the Gaur Purnima festival in Mayapur. The flight to India was to leave from JFK in New York which meant I had to first make my way from Los Angeles to New York. Instead of flying there a day before I decided to leave ten days early and drive across the country. My idea was to stop in and visit as many people with whom I was corresponding as possible. On that first trip (I did another one the following year) my best friend Srutasrava accompanied me. We stopped in Albuquerque, New Mexico — Chicago, Illinois — Kokomo, Indiana — Marion, Virginia — and Titusville, Pennsylvania. As a side note — that year we reserved an entire Air India 747 airplane to accommodate all the devotees going to Mayapur for the festival. The plane left JFK Airport in New York and the only nondevotees on it were the flight crew (pilot, co-pilot and attendants) .. although by the end of the flight devotional feelings in them were undoubtedly awakening. Prasadam was prepared and loaded onto the airplane and at mealtimes the flight attendants did the serving. We had rip-roaring kirtans — going up and down the aisles (some of the sannyasis occupied the first class section where an altar with Radha and Krishna was set up (I believe they were brought by the Radha Damodara Traveling Sankirtan Party). It was quite an experience. In Titusville, Pennsulvania I visited another mail order member named Wendell Phillips. I noticed that when he wrote to me he used letterhead saying “Phillips Motors” and I asked him about it. It turned out that he owned a used car lot. On both that first trip cross country and the next one as well I stopped and stayed with Wendell and while there he took me to the car auction where he bought his cars to resell on his lot. He told me to pick out the car I wanted and then he bid on it. The first time around I purchased a Datsun station wagon and the second time a Mercury Comet. They were both used cars but only a few years old and in excellent condition. I only paid a few hundred for each whereas they would have sold for at least a thousand at any other used car outlet. I arranged later to have the cars driven back to L.A. and ended up giving them away to some householders in the community. Meeting just a few of the people I was writing to was a wonderful experience. The membership program continued successfully year after year as did the BBT Order Dept. but I unfortunately left my service and moved away from the Los Angeles ISKCON community in February of 1980. Many changes had been taking place since the departure of Srila Prabhupada in 1977 and let’s just say that I was disturbed with much of what was going on at the time. I’m sorry to have ended the above story on a sad note. Many years have gone by since 1980 and so much has changed in ISKCON (hopefully all for the good) as well as in my own life (hopefully most for the good). With faith in the unlimited mercy and potency of my beloved spiritual master, His Divine Grace A.C. Bhaktivedanta Swami Prabhupada, I remain hopeful for both the ISKCON institution and myself. I am hopeful that Srila Prabhupada’s ISKCON mission will continue to be a transcendental instrument for spreading Lord Caitanya’s Sankirtana Movement to every town and village and I have hope against hope that I will somehow always have the opportunity to associate with and to serve the devotees of the Lord and never let go of the lotus feet of Sri Sri Guru and Gauranga. Hare Krishna!